Celebration And Prayers In Cairo : The Two-Way But there's also concern among activists that the military isn't meeting with them as it maps out plans for reform. They're aiming to keep pressure on leaders to fulfill their promises. An Egyptian soldier greeted demonstrators with national flags today in Cairo's Tahrir Square. "Tens of thousands of flag-waving Egyptians packed into Tahrir Square for a day of prayer and celebration Friday to mark the fall of longtime leader Hosni Mubarak a week ago and to maintain pressure on the new military rulers to steer the country toward democratic reforms," The Associated Press writes. NPR's Lourdes Garcia-Navarro, who is in Cairo, reports it's also being called a day of "Remembrance and Perseverance." 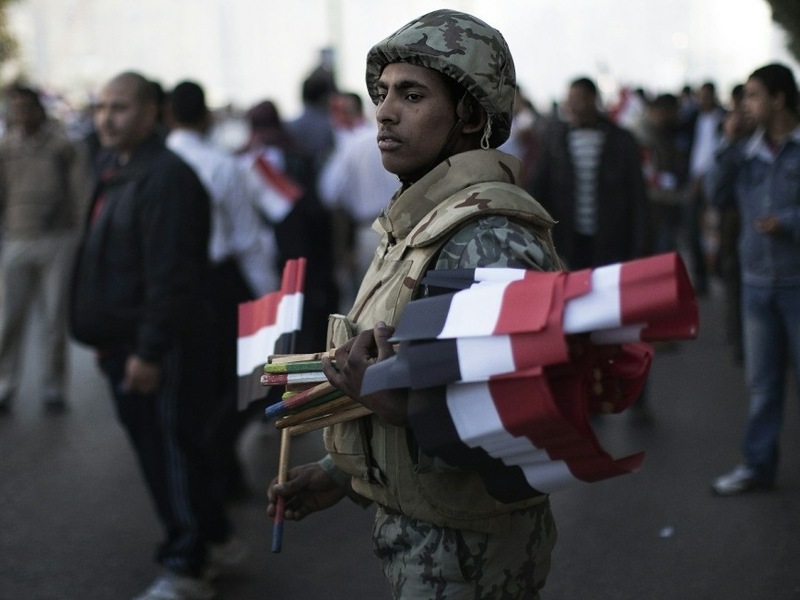 Either way, the message is the same: Those who protested against the now-fallen regime of Hosni Mubarak want to keep up the pressure on military leaders to fulfill their pledge to enact reforms. In the square, "it's a very different kind of mood" than during the protests of recent weeks, Lourdes adds. "There's less defiance. People really are just coming to gather ... it's an air of celebration. ... But clearly, if you speak to long-time activists, there is a sense that much more needs to be done. Of particular concern is the fact that the military is no longer meeting with the youth activists." Meanwhile, NPR's Corey Flintoff reports from the Egyptian city of Suez that "one of Egypt's most important ports and industrial cities has gone from revolution to labor unrest." Steel workers there are calling for better wages and working conditions.